We all know that the regional National Archives are of general interest to genealogy researchers, but many overlook the exhibits. Yesterday, I took the time to tour the fairly new Central Plains National Archives in Kansas City and found it to be far beyond my expectations. Of course I had guessed that the researching stations at its new location west of Union Station would have updated technology, personally I miss the rows of old microfilm readers and head high drawers filled with films replaced by Footnote.com and Ancestry.com and the others. However, it was nice to see the updated computer and research rooms and the bookstore stocked with local interest, even KC barbeque sauce. The new facility is also geared for more family interests, with the souvenir rubbings of famous signatures that any interested historian might wish to have, the “Hands On History” activities, and the interactive distant learning center set up for those “I don’t live close to Kansas City” classrooms. But the best parts, for me, were the exhibits. You can go online to view information on the exhibits, http://www.archives.gov/central-plains/kansas-city/public/exhibits/, but it is hard to capture in a paragraph or two how engaging the current one “It’s Big” actually is. I spent about ninety minutes, with most of that time in the basement (which it should be showcased in a more prestigious floor or the renamed the 1st floor) allowing the exhibits give life to history. From my experience, and I actually live here, I have to recommend that any genealogist or historian looking for information on the central and northern plains take the time to visit the “basement” of this facility. 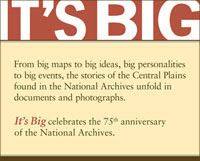 The “It’s Big” exhibit and the Kansas – Nebraska Act, http://www.archives.gov/central-plains/kansas-city/public/exhibits/its-big.html, is on display just a few more days, but it enjoyably fills in the history of the plains through its documents and photographs. Although beginning February 9th there will be an exhibit that will interest those who love historical maps, "Mapping Missouri,” I’m looking forward to the next exhibit “Deadly Medicine: Creating the Master Race” that will run from March 16 – June 10.